1. Line up triangles and sew an accurate 1/4"
3. Pin! I'm not usually a big on pinning... but it really helps when working with the bias and this many seams. Also I suggest you don't cut off the "dog ears" along the way as they will actually help you line up pieces. 4. Don't obsess! 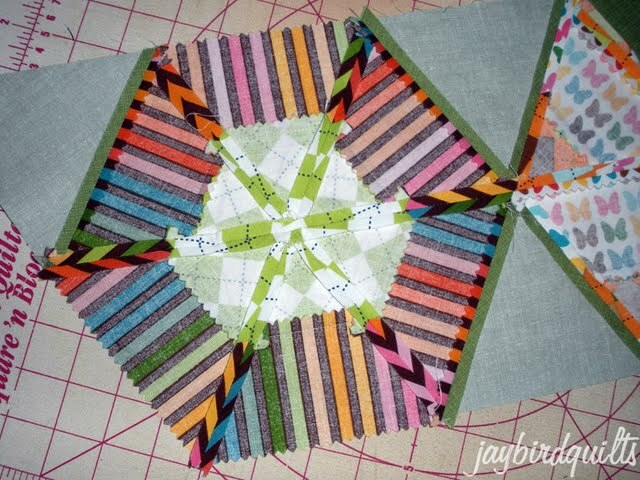 Many of my seams within blocks aren't perfect... but often you can't tell because the same fabric is meeting up with itself. I focus on seams where blocks meet & there is a lot of contrast. 2. 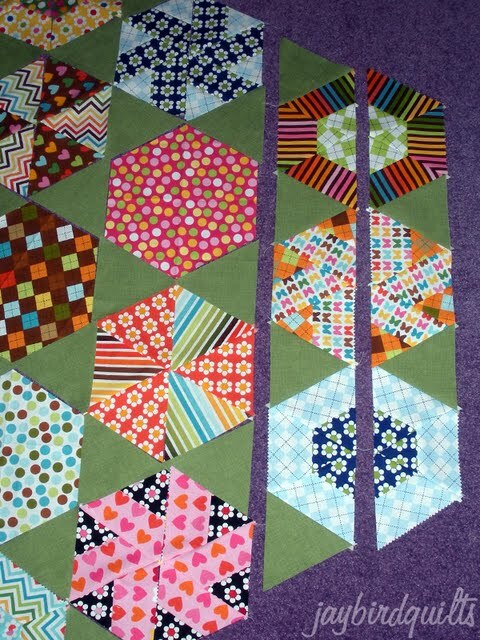 In addition to the 32 blocks you'll need 6 "fillers" for the sides. 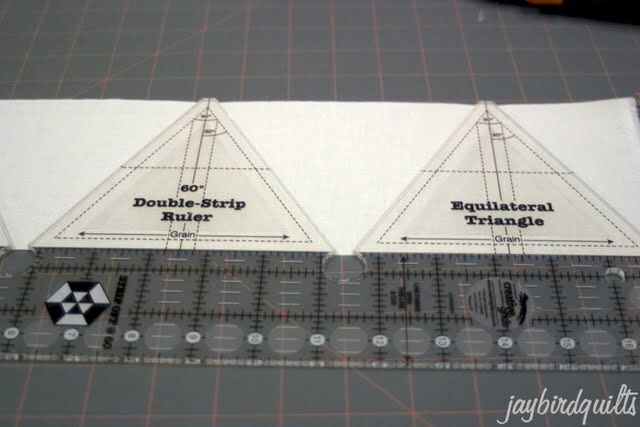 They can be made by cutting two 4.5" strips x WOF of your solid. Then subcut these strips using the template from block 7. 3. You'll be sewing the quilt together in vertical columns. 4. 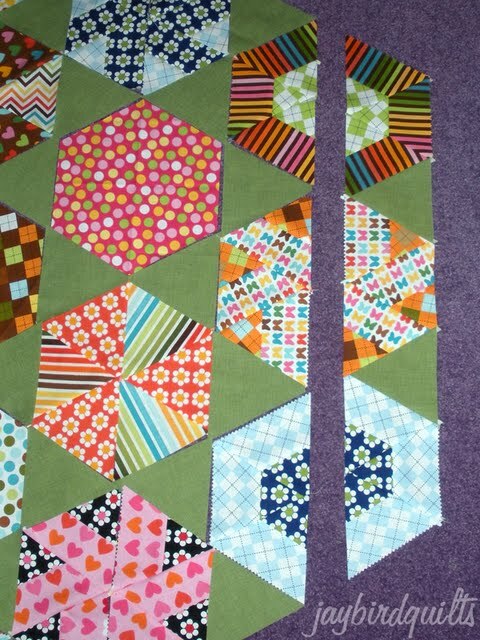 I suggest sewing one column at a time so that you don't mix up your pieces. This layout will have 10 columns. 5. 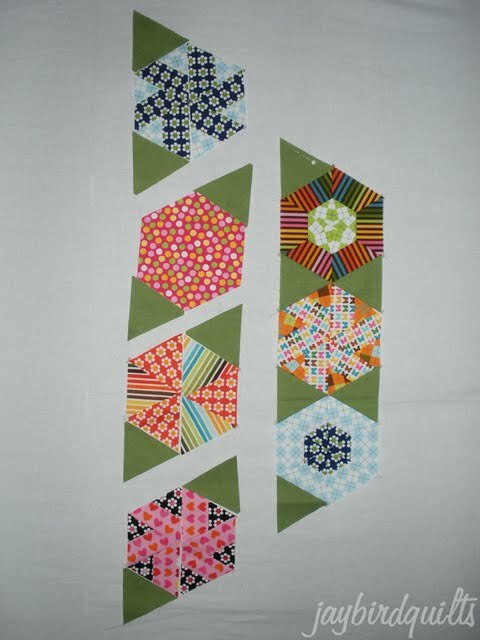 Continue sewing until you have all 10 columns together. 6. 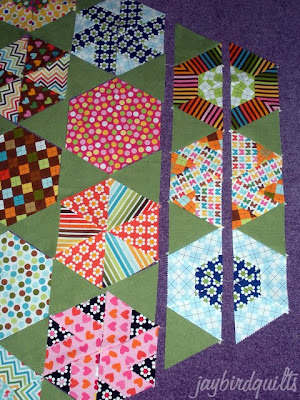 Then begin to sew the columns together. Continue until you have the entire quilt top done. 1. 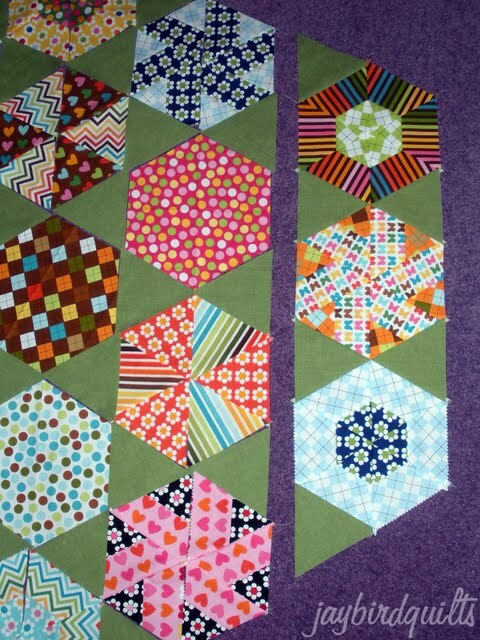 Again I started by laying out all my blocks. 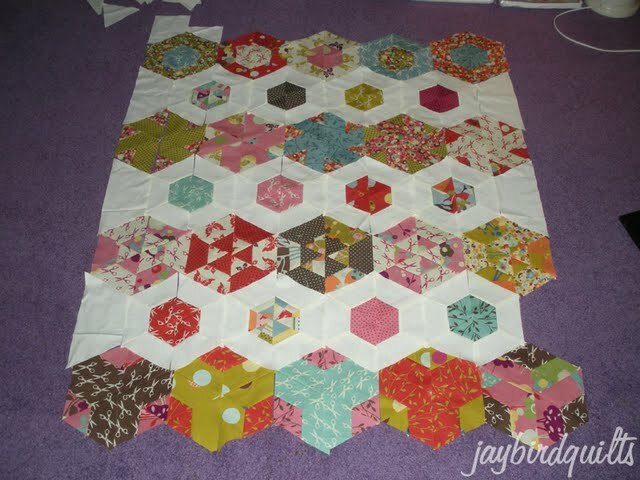 I decided on having the final shape of my layout to be one giant hexagon. 2. In addition to the 19 blocks you'll need 36 "fillers" for the setting. They can be made by cutting three 4.5" strips x WOF of your solid. 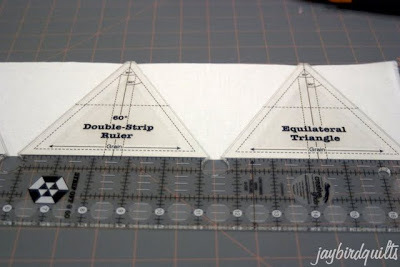 Then subcut these strips using your ruler as shown below. 3. 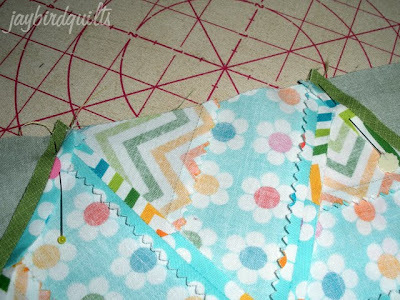 You'll be sewing the quilt together in vertical columns similarly to layout #1. 5. Repeat for the next column. 6. 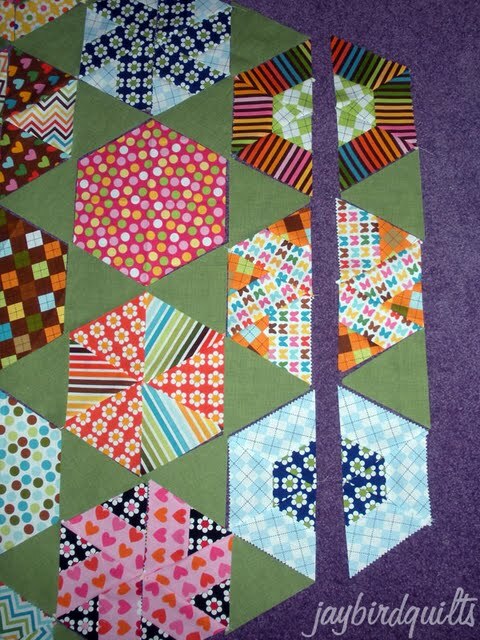 Sew the 2 columns together. 7. 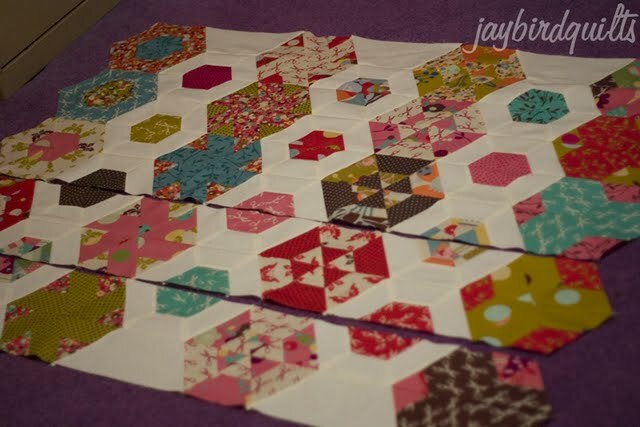 Things are a bit different when sewing columns with solid hexagon blocks. 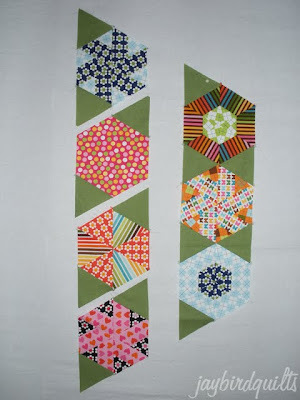 You'll be working with 2 columns at a time as shown below. Attach the setting triangles to the hexagon blocks as shown. 8. You should end up with four units as shown below. 9. Sew these units together to finish a wide column of hexagons. 10. Continue this until you have 5 wide columns put together. 11. 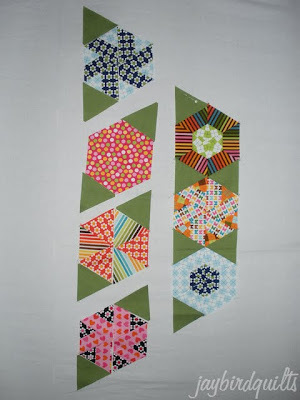 Sew these columns together to finish your quilt top! thanks for joining me on this hexagon journey!!! Thanks Julie!!! 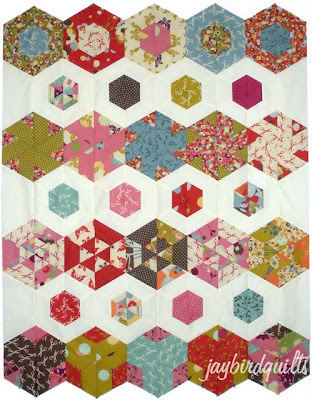 What an awesome job you did leading us through this quilt along. I LOVE the 2nd layout & so that is the way I am going to go. Keep up the great work - you keep us all motivated!!! 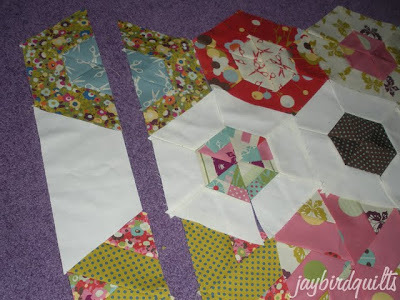 I definitely want to make layout #2!! These hex quilts are beautiful! You have made them lok easy & fun. Thanks , Julie! 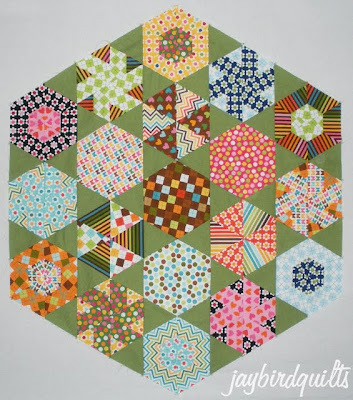 You did a great job in this QAL. I'm so glad that I decided to join. I LOVE that striped fabric. Do you by any chance remember what line that is? Thanks for the quilt-a-long. 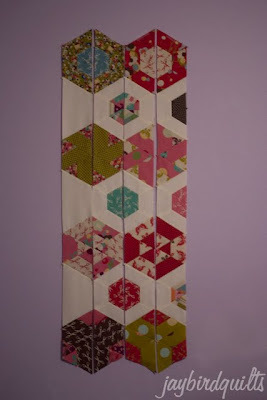 I haven't quite kept up but I'm going away for a quilting weekend with friends and I'm taking my quilt-a-long...along! And I just realized what a dumb comment I made about the "striped fabric," since you have a lot of pictures in this post. 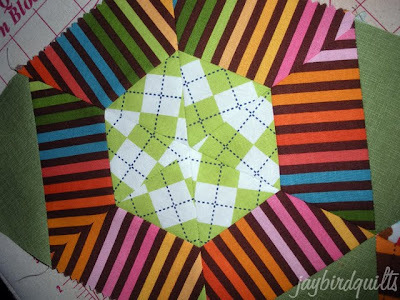 I meant the striped fabric in the fourth picture down, before you start the layout examples...is it from Remix? 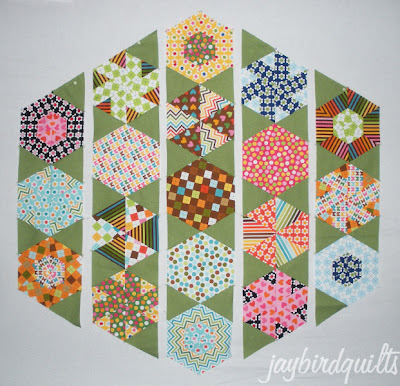 Thank you for running this quilt along! Now I better make my final lay-out decision. Wow Julie, these turned out great! 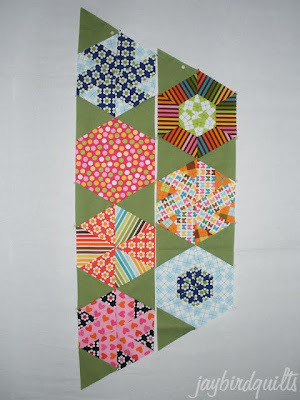 I love the one with the white it gives a paper lantern kind of feel. at least to me, but you know me ;] What a fun project. Thanks for such a fun quilt Julie. I have tried all the blocks at least once and now that I have seen the suggested layouts I can get going I what I need. 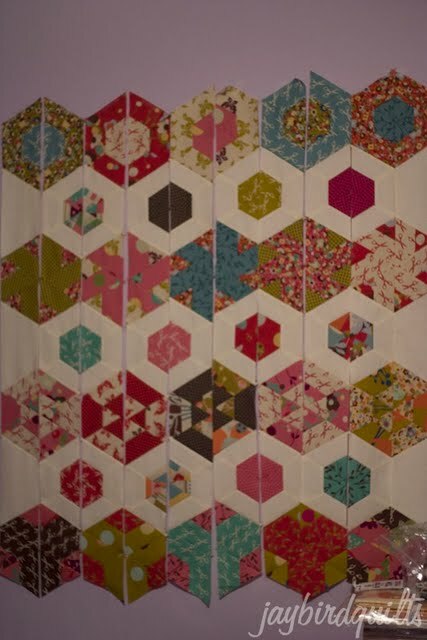 Think its going to be larger and filled with all the blocks, stay tuned! 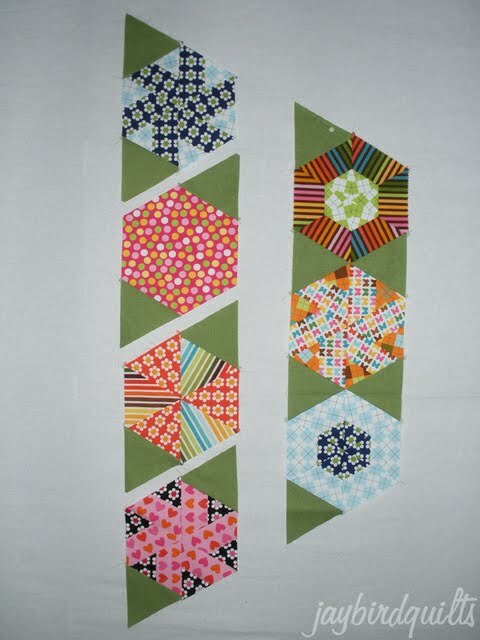 Love both layouts...they went together pretty easily. I can't wait to make another (hopefully) bigger one to keep for myself! I just uploaded a photo onto the flickr group. Hope you like it!! You are my hero, it has been too long since I have visited your blog and your inspiration is fabulous! Thank you for sharing your talent! Hey! I'm so sorry I missed this. 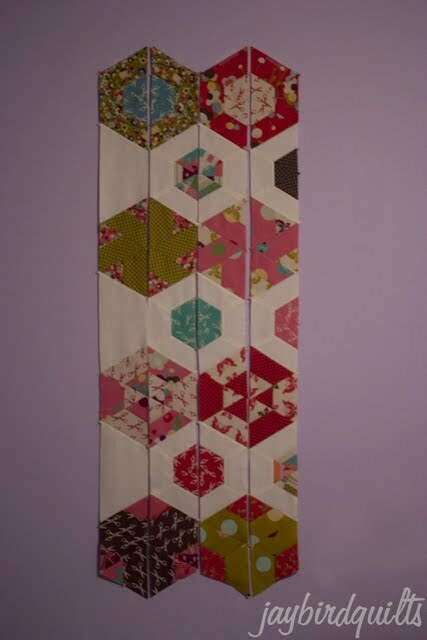 When I finally got my act together and had all the supplies -- I mean literally my strips are on my cutting table laid out and ready to cut -- I had an accident that has laid me up for 12 weeks! We had to move from our RV back to the house (steps are tough when you can't bear weight on one foot) and I haven't been able to sew (casted right foot and sewing machine petal don't mix)! So, I'm hoping in two weeks to be cleared to walk again, we can move back home, and I'll be able to start/finish this project!